Does anyone have experience with either of these bands and which do you consider "better"? I have a DeepSea and am not wild about the RubberB version that overlaps the lugs. Had the rubber b and while it looked good, it was very difficult to install. There needs to be more room to engage the springbars. Comfort wise, it couldn't compete with the factory bracelet. I've had both for my Rolex Sub and Everest is the way to go - both are high quality, but Everest is much easier to install and they give you a lot more options. Gives my Sub a lot more versatility. I've had two Rubber B straps for my DSSD: one all black; the other with the white stripe. Difficult to install? How? Spring bar tool...and done. If you struggle, take it to a watchmaker and for $5.00 (or gratis), they can install in no time. The stripe really pops and makes the bezel engraving and dial pop as well. I think that "overlap" you're talking about is necessary to allow the strap to be wider. That extra width really balances out the look of the DSSD, because as you know, many people complain that the bracelet is too narrow. The straps are purpose built to fit Rolex watches and to me, they look better than OEM (well, all we have is the Oysterflex). 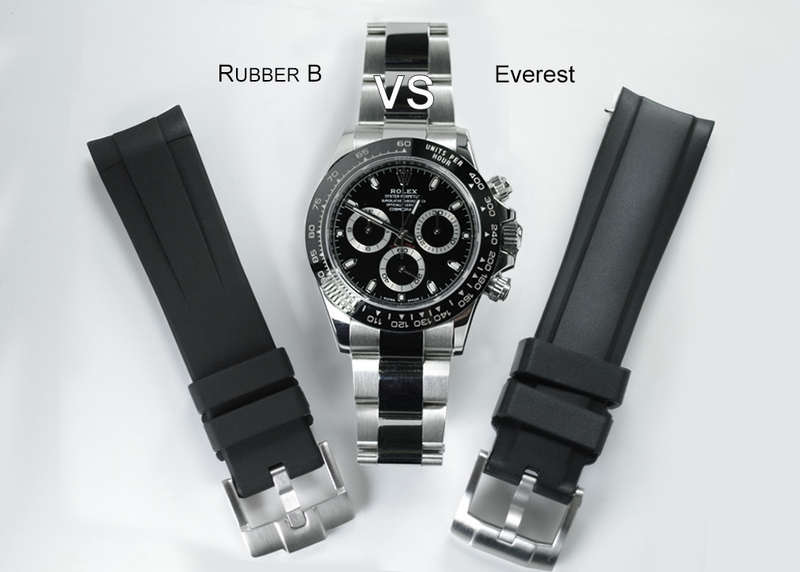 I did a full Review of both Rubber B and Everest straps on a Rolex Daytona. Check it out on Rob's Rolex Chronicle. Next Topic: The Dark Knight RISES!